Time for this week’s fodder, teenagers driving at night on a deserted road in a truck that becomes spookily cold. They also have a GPS phone that talks to them – really to them. The girl, Janet, is told to get out of the truck which she wisely does while the boy, Billy, is driven off a bridge. To the Winchester cave and this week Dean is tired of trying to find a cure for the Mark since they’re not getting anywhere. Instead he wants to go on the case of the haunted truck. On to the university where Janet attends and Dean creeping creepily over all the college women. The do the fake FBI skit (while Dean continues to creep on the college women). Other than basically recapping the haunting, Dean learns how very very dated he is. They also learn that Billy’s brother Joey died in Afghanistan, didn’t get on with Billy and that the truck was his first. They find the truck confirm it’s a ghost and posit the theory that ghost Joey killed his little brother for driving his truck (a motive Dean agrees with). Time for salting and burning and we know this isn’t the answer because it’s waaay too early in the episode. Julie, another college student who receives a creepy chat message from someone saying “810” “I know” which apparently frightens her – enough that she seems to forget that block buttons exist. Time for cold, telekinesis, lots of “810” messages – and being strangled with a computer wire (also screaming at a USB wire which is just… not courageous it has to be said). Sam and Dean pull their FBI shtick to get all the info on the latest death and questioning her friend reveals nothing. Burrowing through her social media reveals nothing. The cafeteria is Dean’s idea of heaven though. But the searching does reveal to Dean that his internet browsing doesn’t disappear just because he deleted it (no we don’t need to know) and they do find the chat message. They track down the chat account and see a woman throwing floral tributes left by a lamp post into a bin liner. They learn that her husband died shortly after they were married and she hates the fact the flowers remind her of the death. They do learn about the college student sending the floral tributes. 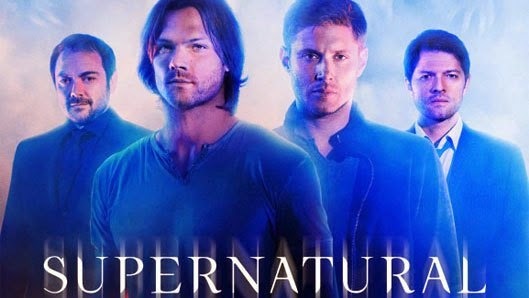 To Dean and Sam finally questioning Delilah who reveals the four of them caused Andrew’s death by accidentally driving him off the road while they were all far too interested in their mobile phones and then fleeing the scene and Billy refusing to call the police because his license was suspended. Of course, Delilah is the nice one who wants the rest to go to the police but is convinced not to. They put her in a salt circle while they try to figure out how the ghost is moving around so much while Delilah continues her “I’m the good one” speeches by talking about how tortured and guilty she feels. Dean talks about his own coping methods for the huge guilt baggage he carries – whisky, denial and making things better; he advises Delilah to seek forgivness right as Sam discovers the ghost is using wifi. Dean rampages around smashing everything connected to wifi as ghostly Andrew appears in the screens – they run to the basement where reception is poor (since salt doesn’t work so well because wifi is everywhere). Over at the basement Dean swipes at a manifesting Andrew and tries to reason with the ghost to stop him losing his humanity. Dean doesn’t get through – but a message (via Sam and mobile phones) from Corey encouraging him to move on gets through and he vanishes. Day is saved! Aftermath – Delilah goes to confess to Corey. I suspect death will not be the (permanent) answer. This is Supernatural after all. So, I like the call back, I like the reminder of who and what the Winchesters are – especially with Dean’s affirmation that, basically, helping people is what he’s clinging to (and how he is holding off the Mark). Which requires a greater focus on helping people rather than focusing on the big, epic bad du jour (which technically does help people but in a grander, more meta-sense). This could also mean lots of monster of the weak episodes – I think it could work so long as they also include plenty of Mark development and it may actually be a relief to see a lack of big bad after several seasons of trying to up the stakes. Though, I think it would have worked better of the writers weren’t even less out of touch than Dean – it felt like a clumsy collection of millennial stereotypes more than anything else which rather detracted from the whole thing with lots of cringeworthiness. Equally cringeworthy was Dean’s completely unnecessary drooling over all the college women; what did it add beyond a desperate attempt to remind us that Dean is horny and likes women? We know this over and over again. Was it a great episode? Not really – and I’d like more exposition on what “fight until I go down swinging” actually means. But it wasn’t bad and was nicely classic.